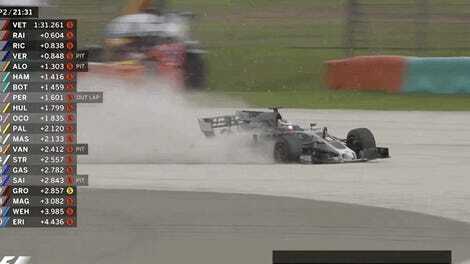 Formula One’s last Malaysian Grand Prix—for now—was an oddly intense one. A drain cover came up in a Friday practice session, slashing Romain Grosjean’s tire and sending him into a wall. As soon things got back underway the next day, one of F1’s support races had a grand total of zero cars finish. 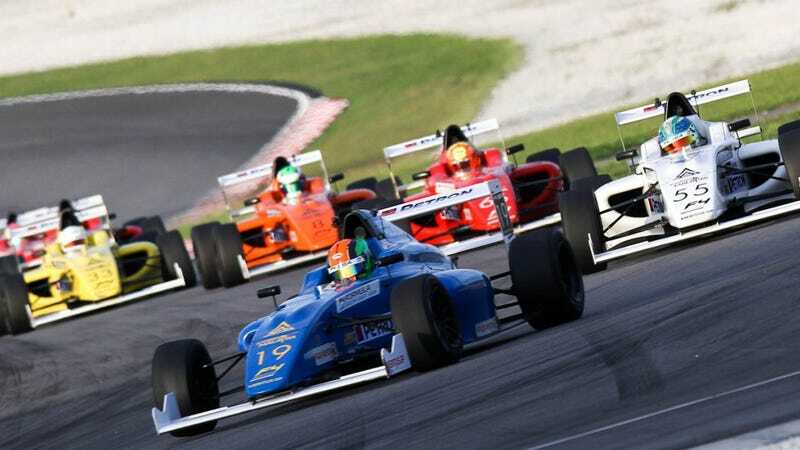 The Formula 4 Southeast Asia Championship competed alongside F1 at Sepang International Circuit over the weekend, but the drivers didn’t get all of their laps in. Like the kind of racing finish you’d see in a wondrous alternate universe that we’ve all secretly wished for since Talladega Nights came out, every car was out of the race before it ended. Unfortunately, there were no reported foot races to the finish line. Autosport reports that the lack of cars finishing wasn’t due to wrecks or other on-track issues, but rather a technicality: Two of the six F4 races at Sepang that weekend, all eight laps long, had to be run back to back on Saturday morning after the drain messed up the schedule. Fuel miscalculations for the doubled-up races led to every single car running out before the end of the second race. By the seventh of eight laps, Autosport reports that seven cars had stopped on track after running out of fuel. Officials called out a safety car, and only one car was running by the final lap. The driver, Kane Shepherd, creeped along but ran out in the second turn, according to Autosport. The safety car was the only one left to complete the final lap. Come on, y’all. This was the perfect opportunity to Ricky Bobby this thing, and nobody took off running. What a sad, sad weekend for motorsport.